The monarchs, Danaus plexippus Linnaeus, are among the best known of the world's butterflies, due to their remarkable ability to migrate, wide distribution, and charismatic appearance. The last Pleistocene glaciations in North America instigated migration to Mexico in the east and to Californian coast and deserts in the west. In the western U.S., the overwintering colonies are smaller and more numerous, while in Mexico, they are few, but more spectacular, with billions of butterflies concentrating in one spot. Figure 1. Adult monarchs, Danaus plexippus Linnaeus, from Gainesville, Florida. Photograph by Andrei Sourakov, Florida Museum of Natural History. Figure 2. Adult monarchs, Danaus plexippus Linnaeus, migrating at their Mexican overwintering site in Sierra Madre, Michoacán. Photograph by Andrei Sourakov, Florida Museum of Natural History. Danaus plexippus is found throughout the Americas and Australia, with individuals reported in New Guinea and Western Europe. Sedentary populations that are found in Mexico, Central and South America (including the Caribbean islands) are somewhat different from migratory populations of D. p. plexippus found in North America. Several subspecies, such as M. p. megalippe (Mexico, southern U.S.) and M. p. menippe (South America) have been described. 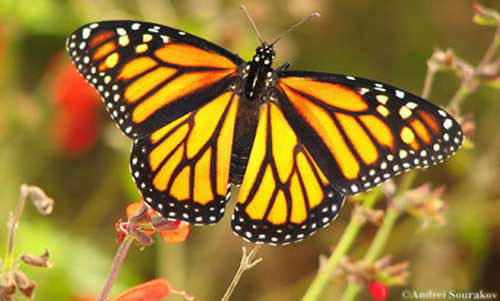 Monarchs fly from sea level up to 2,500 meters. Some of the D. p. plexippus reach Cuba instead of Mexico, where they mix with the resident population of D. p. megalippe, from which they noticeably differ in behavior and wing length and shape (Dockx 2007). Figure 3. Adult monarch, Danaus plexippus Linnaeus, emerging on Christmas day in the resident population in North Florida, Gainesville. Photograph by Andrei Sourakov, Florida Museum of Natural History. Figure 4. 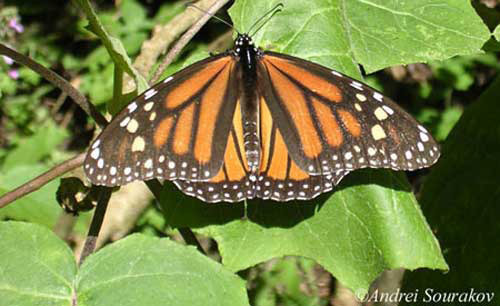 Adult migrating monarch, Danaus plexippus Linnaeus, in Mexico. Photograph by Andrei Sourakov, Florida Museum of Natural History. Orange-and-black warning coloration of monarchs is noticeable, and its memorable pattern is directed at repelling insectivorous birds. Experiments conducted with captive blue jays showed that monarchs indeed are toxic (Brower et al. 1968). Being distasteful due to ingestion by larvae and sequestration by adults of cardenolides that are toxic to birds, monarch serves as a model for several mimetic species and is frequently confused with the viceroy (Limenitis archippus (Cramer, 1776)) and queen (Danaus gilippus (Cramer, 1775)) butterflies. That mimicry is considered to be Müllerian, with all species involved being distasteful to some degree and contributing to each others' defense (Ritland and Brower 1991). Figure 5. Viceroy butterfly, Limenitis archippus (Cramer, 1776), upperside, Gainesville, Florida; a mimic of the monarch, Danaus plexippus Linnaeus. Photograph by Andrei Sourakov, Florida Museum of Natural History. Figure 6. Viceroy butterfly, Limenitis archippus (Cramer, 1776), underside, Gainesville, Florida; a mimic of the monarch, Danaus plexippus Linnaeus. Photograph by Andrei Sourakov, Florida Museum of Natural History. Other than its mimics, the monarch can be confused with very few other butterflies. 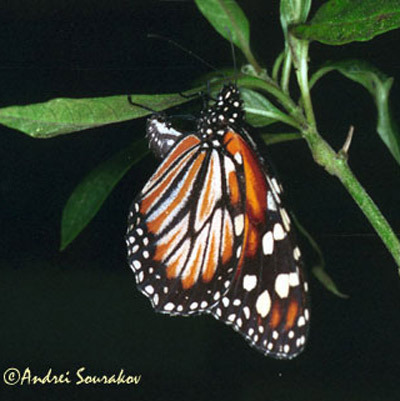 However, on the islands of Hispaniola and Jamaica, a smaller Jamaican monarch, Danaus cleophile (Godart, 1819), can be found flying together with the D. plexippus. Figure 7. Jamaican monarch, Danaus cleophile (Godart, 1819), ovipositing on Asclepias nivea in Cordillera Central, Dominican Republic. Photograph by Andrei Sourakov, Florida Museum of Natural History. 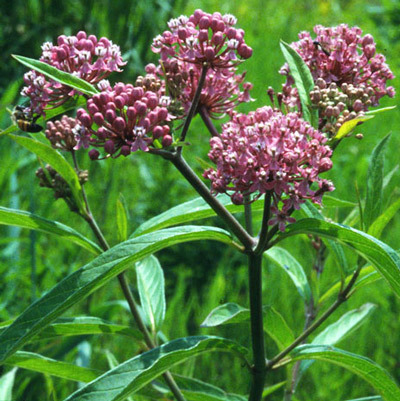 Monarchs lay their eggs singly on underside of the leaf and sometimes on the flowers of different milkweeds (Asclepidaceae: Asclepias). Figure 8. Egg of the monarch butterfly, Danaus plexippus Linnaeus, on the underside of the leaf of scarlet milkweed, Asclepias curassavica, Gainesville, Florida. Photograph by Andrei Sourakov, Florida Museum of Natural History. 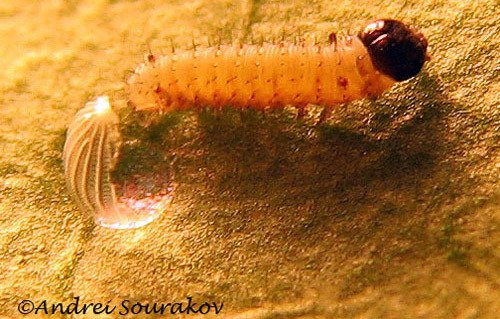 The first instar larva is white with a black head. 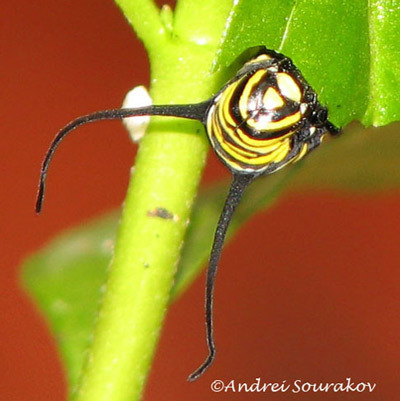 The larva develops a more conspicuous striated yellow-and-black coloration in the second instar. This coloration varies depending on subspecies in mature larvae. Larvae also develop two thoracic and two abdominal dorsal filaments. Figure 9. 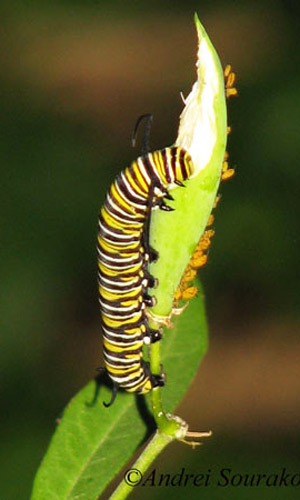 First instar larva of the monarch butterfly, Danaus plexippus Linnaeus, hatches from the egg, which it immediately consumes. Gainesville, Florida. Photograph by Andrei Sourakov, Florida Museum of Natural History. Figure 10. Fourth instar larva of the monarch butterfly, Danaus plexippus Linnaeus, Gainesville, Florida. Photograph by Andrei Sourakov, Florida Museum of Natural History. Figure 11. Fifth instar larva of the monarch butterfly, Danaus plexippus Linnaeus, feeding on scarlet milkweed, Asclepias curassavica. Photograph by Andrei Sourakov, Florida Museum of Natural History. Figure 12. Close-up of the head of a fifth instar larva of the monarch butterfly, Danaus plexippus Linnaeus, feeding on scarlet milkweed, Asclepias curassavica. Photograph by Andrei Sourakov, Florida Museum of Natural History. 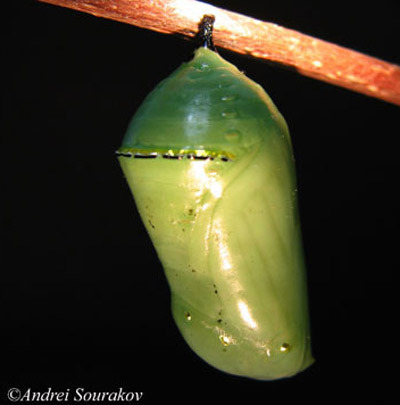 The pupa (chrysalis) is formed by the larva hanging on a substrate, such as underside of leaves and twigs, usually away from the host plant. When formed, it is green with gold markings. Figure 13. Pupa of the monarch butterfly, Danaus plexippus Linnaeus. Photograph by Andrei Sourakov, Florida Museum of Natural History. Figure 14. Adult monarch butterfly, Danaus plexippus Linnaeus, emerging from the pupal case. Photograph by Andrei Sourakov, Florida Museum of Natural History. 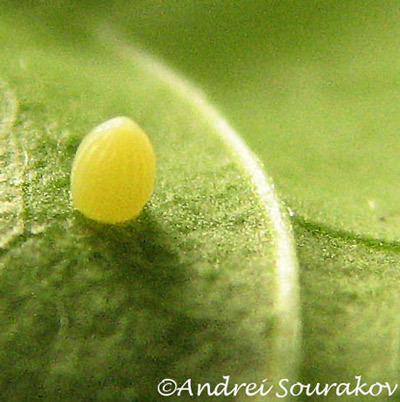 Development from egg to adult takes less than a month. In North America, the monarchs go through at least four generations a year, before they start migrating south in the Fall. Adults are strong fliers and can fly for 11 hours straight. In the Fall, enough fat is stored in the adults to allow a continuous 1000 km flight without feeding. Some make a journey of a total of 4000 km to reach overwintering sites in the Sierra Madre de Oriente, where they settle inside the coniferous forest of the state of Michoacán. 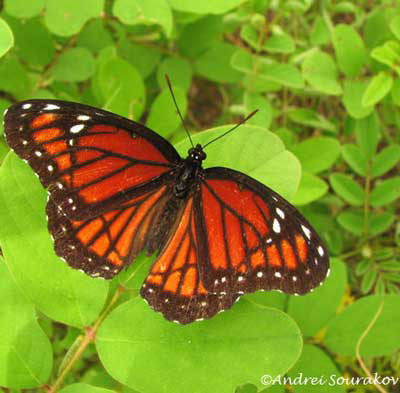 Monarchs also fly across Gulf of Mexico with overwater flights of 600 km. Figure 15. 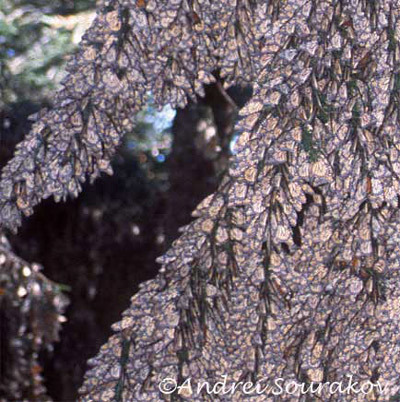 Adult monarch butterflies, Danaus plexippus Linnaeus, covering fir trees in the overwintering colony at El Rosario, in Sierra Madre, Michoacán, Mexico. Photograph by Andrei Sourakov, Florida Museum of Natural History. Figure 16. Close-up of adult monarch butterflies, Danaus plexippus Linnaeus, covering fir trees in the overwintering colony at El Rosario, in Sierra Madre, Michoacán, Mexico. Photograph by Andrei Sourakov, Florida Museum of Natural History. Figure 17. Adult monarch butterflies, Danaus plexippus Linnaeus, migrating at their Mexican overwintering site in Sierra Madre, Michoacán, Mexico. Photograph by Andrei Sourakov, Florida Museum of Natural History. Figure 18. Close-up of an adult monarch butterfly, Danaus plexippus Linnaeus, migrating at its Mexican overwintering site in Sierra Madre, Michoacán, Mexico. Photograph by Andrei Sourakov, Florida Museum of Natural History. A tagging program was initiated by F. A. Urquhart of the Royal Ontario Museum in the 1950s and is continued to this day. It allowed scientists to determine the migration path of monarchs. Figure 19. Tagged adult monarch, Danaus plexippus Linnaeus, Gainesville, Florida, released during the Butterfly Festival, October 2007. Photograph by Andrei Sourakov, Florida Museum of Natural History. Monarchs feed extensively on the way, accumulating body fat sufficient to last them through the winter. 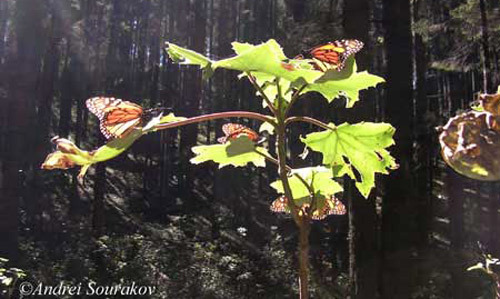 At the overwintering sites in Mexico, the monarchs spend over four months in a reproductive diapause. They feed and drink as the weather warms up, but return to their resting sites. Figure 20. Adult monarchs, Danaus plexippus Linnaeus, drinking at the creek in El Rosario Colony, Michoacán, Mexico. Photograph by Andrei Sourakov, Florida Museum of Natural History. Figure 21. Adult monarchs, Danaus plexippus Linnaeus, sunning themselves before going to feed, El Rosario overwintering colony, Michoacán, Mexico. Photograph by Andrei Sourakov, Florida Museum of Natural History. Figure 22. Adult monarch, Danaus plexippus Linnaeus, feeding. Photograph by Andrei Sourakov, Florida Museum of Natural History. 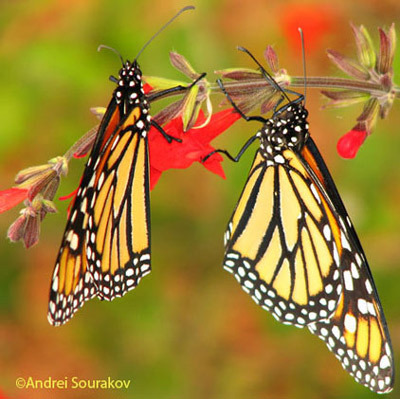 Courtship behavior of monarchs has been described in detail and consists of a mating ritual, where male grasps the female in the air and brings her down to the ground, where mating occurs. Mating occurs several times, both during the summer and at the overwintering sites. Mating attempts frequently fail due to resisting by females (e.g., Frey, 1997). Monarchs begin to fly north in March, reproducing along the way. Migration north continues, with the second and third generations recolonizing the continent. The ability to navigate to the overwintering sites is genetic and is linked to time-compensated sun compass orientation. This ability requires constant recalibration of genetic program by changing surrounding. It is linked to the activity of the central complex is a midline structure consisting of protocerebral bridge and central body in Monarch's brain. Geomagnetic forces are probably used as monarchs get closer to their overwintering sites, since the migratory monarchs' bodies contain higher quantities of magnetic material than non-migrating butterflies. The vicinity of overwintering sites in the Mexican Transvolcanic Range contains high level of magnetic anomalies, which probably helps monarchs to find them. Social behavior and pheromones probably also play large role in choosing the overwintering site. To understand migration, the gene expression patterns that define the migrating monarchs are being investigated. Specific genes are regulated by juvenile hormone, which is responsible for interruption of reproductive behavior and initiation of migration. Micro RNAs regulate gene expression, and each miRNA can regulate several proteins. In other systems, miRNAs are involved in epigenetic developmental events. They may be involved in initiating/mediating the migratory state in monarch butterflies. Recent analysis of genomes of migratory and non-migratory monarchs shows that monarchs originated in North America from a migratory ancestor. The effort to assess genome of monarchs, which proves to be smaller than in other butterflies, and more similar in size to that of mosquitoes is being made (Zhu et al. 2008). Monarchs are great model organisms for researching many general questions about animals in general. For instance, recent studies conducted on monarchs allowed for understanding the evolution and function of cryptochrome proteins in animals (Zhu et al. 2008). Cryptochromes are critical for circadian timing in butterfly's clock mechanism. In monarchs, one of the cryptochromes functions as a likely circadian photoreceptor, while another appears to function as the major transcriptional repressor of the clockwork transcriptional feedback loop. Monarch toxicity has been linked to the toxicity of the plants upon which they feed. 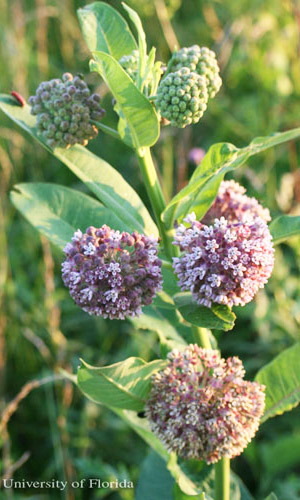 Monarchs oviposit on milkweeds of the genus Asclepias from which the caterpillars collect the cardiac glycosides toxic to birds. These substances are passed on to the adult butterflies, which are also toxic. The idea of automimicry (that some monarchs are more toxic than others, but that the birds, unable to distinguish between the traits, avoid all of them) has been investigated (Brower et al. 1970). Apparently, there are costs and benefits to the ingestion of glycosides, since it was shown that monarch females prefer plants with intermediate cardenolide level, rejecting higher and lower level-containing plants (Oyeyele and Zalucki, 2008). Figure 23. Adult monarch butterfly, Danaus plexippus Linnaeus, feeding on flower of scarlet milkweed, Asclepias curassavica. Photograph by Andrei Sourakov, Florida Museum of Natural History. Figure 24. Pinewoods milkweed, Asclepias humistrata Walter (Apocynaceae), a host of the monarch butterfly, Danaus plexippus Linnaeus. Photograph by Jerry Butler, University of Florida. Figure 25. 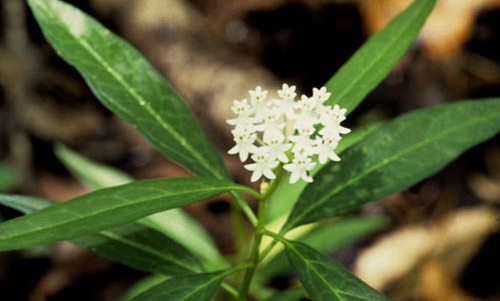 White swamp milkweed, Asclepias perennis Walter (Apocynaceae), a host of the monarch butterfly, Danaus plexippus Linnaeus. Photograph by Donald Hall, University of Florida. Figure 26. Butterfly milkweed, Asclepias tuberosa L. (Apocynaceae)), a host of the monarch butterfly, Danaus plexippus Linnaeus. Photograph by Donald Hall, University of Florida. Figure 28. 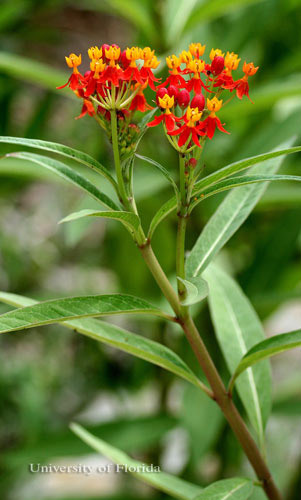 Scarlet milkweed, Asclepias curassavica L. (Apocynaceae), a host of the monarch butterfly, Danaus plexippus Linnaeus. Photograph by Donald Hall, University of Florida. Figure 29. Common milkweed, Asclepias syriaca L. (Apocynaceae), a host of the monarch butterfly, Danaus plexippus Linnaeus. Photograph by Donald Hall, University of Florida. Monarchs are not endangered as a species due to many sedentary populations in the south of its range. 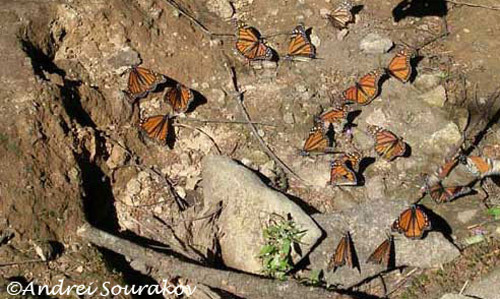 However, the deforestation around their overwintering sites in Mexico puts the northeastern population of monarch and the remarkable phenomenon of migration in danger. For instance, in 2002 severe winter weather killed off an estimated 80% of Monarchs in overwintering colonies in Sierra Chincua and Sierra Campanario, with some colonies reduced in size by 90% (Brower et al. 2004). In late August 2014, the Xerces Society, Center for Food Safety, Center for Biological Diversity and Dr. Lincoln Brower submitted a petition to the Secretary of the Interior requesting the Monarch butterfly be listed as “threatened” under the Endangered Species Act. A few years ago, the controversy over the influence of Bt corn on Monarch mortality arose. However, though mortality due to ingestion of corn pollen does occur, it has been shown that its effect on Monarch population might not be as dramatic as was initially thought (Auman-Bauer 2001). Birds such as black-beaked orioles and black-headed grosbeaks attack monarchs at their overwintering sites. Apparently the toxins deteriorate during the migration, hence the birds can eat them. Orioles slit open the monarchs' abdomens avoiding most of the toxins in the cuticle. Grosbeaks eat the entire abdomen and can tolerate higher levels of cardenolides. These two bird account for over 60% of the total monarch mortality. 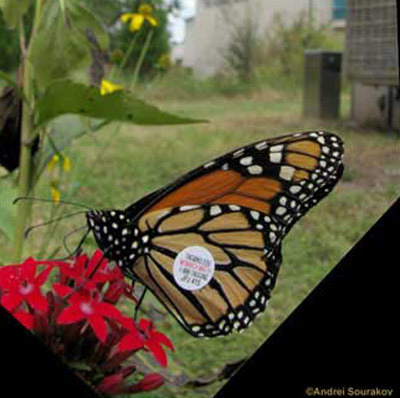 Among other vertebrates, rats have been observed feeding on monarchs at overwintering sites. 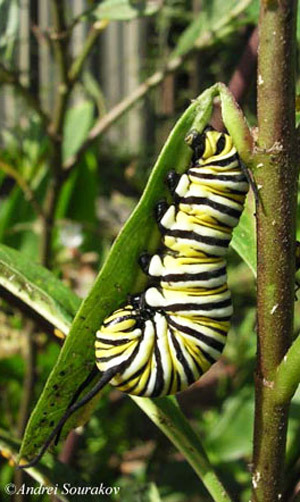 Invertebrate predators such as ants, spiders, and wasps attack monarch larvae on milkweed plants. Tachinid flies and braconid wasps are known to parasitise larvae. Several entomopathogenic organisms can infect monarchs, including a nuclear polyhedrosis virus and Pseudomonas bacteria, protozoan parasites such as Ophryocystis elektroscirrha, and a microsporidian Nosema species (McLaughlin and Myers 2007). Ackery PR, Vane-Wright RI. 1984. 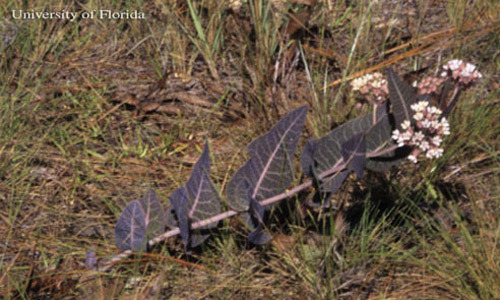 Milkweed Butterflies, their Cladistics and Biology. London: British Museum (Natural History). 425 pp. Auman-Bauer K. (2003). Bt Corn & Monarch Butterflies. Biotechnology Food and Agriculture. http://unveiled.info/monsanto/newsnviews/monarch2.htm (18 August 2011). Brower LP, William NR, Coppinger LL, and Glazier SC. 1968. Ecological chemistry and palatability spectrum. Science 161: 1349-1350. Brower LP, Pough FH, Meck HR. 1970. Theoretical Investigations of Automimicry, I. Single Trial Learning. PNAS 66: 1059-1066. Brower LP. 1985. 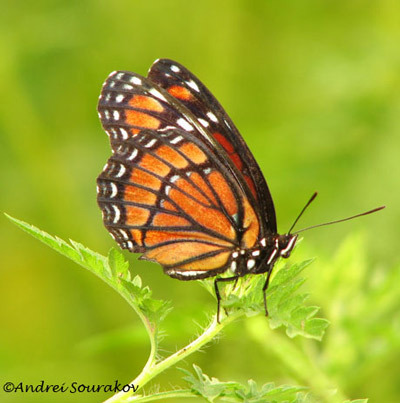 Biological rationale for the conservation of the overwintering sites of the monarch butterfly, Danaus plexippus L., in the states of Michoacan and México. Pages 66-88. In Primer simposium internacional de fauna silvestre. Secretaria de Desaarrolo Urbano y Ecologia, México City. Brower LP. 1995a. Understanding and misunderstanding the migration of the monarch butterfly (Nymphalidae) in North America: 1857-1995. Journal of the Lepidopterist's Society 49: 304-385. Brower LP. 1995b. Revision a los mitos de Jurgen Hoth. Ciencias 39: 50-51. Brower LP. 1996. Forest thinning increases monarch butterfly mortality by altering the microclimate of the overwintering sites in México: Decline and conservation of butterflies in Japan III. Pages 33-44. In Ae SA, Hirowatari T, Ishii M, Brower LP (editors). Proceedings of the international symposium on butterfly conservation, 1994. The Lepidopterological Society of Japan, Osaka. Brower LP. 1999a. Para comprehendar la migracion de la mariposa monarca (1857-1995). Instituto Nacional de Ecologîa, México, D.F. Brower LP. 1999b. Biological necessities for monarch butterfly overwintering in relation to the oyamel forest ecosystem in México. Pages 11-28. In Hoth J, Merino L, Oberhauser K, Pisanty I, Price S, Wilkinson T (editors). Paper presentations: 1997 North American conference on the monarch butterfly. The Commission for Environmental Cooperation, Montreal. Brower LP. 1999c. 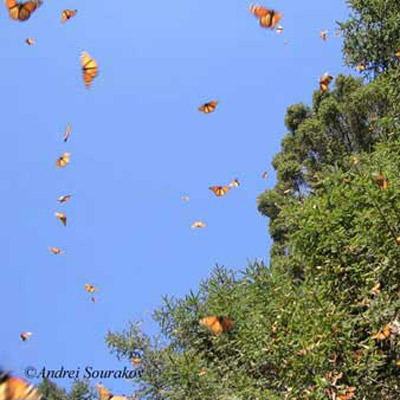 Oyamel forest ecosystem conservation in México is necessary to prevent the extinction of the migratory phenomenon of the monarch butterfly in North America. Pages 41-50. In Proceedings of a symposium on Animal Migration, 1997. United Nations Environment Program and Convention on the Conservation of Migratory Species of Wild Animals, Bonn and The Hague. Brower LP, Missrie M. 1998. 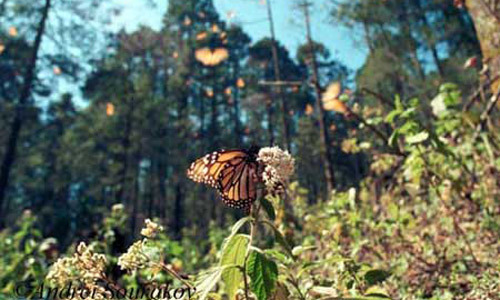 Fires in the monarch butterfly sanctuaries in México, Spring 1998. Que Pasa (Toronto) 3: 9-11. Brower LP, Castilleja G, Peralta A, Lopez-Garcia J, Bojorquez-Tapia L, Diaz S, Melgarejo D, and Missrie M. 2002. 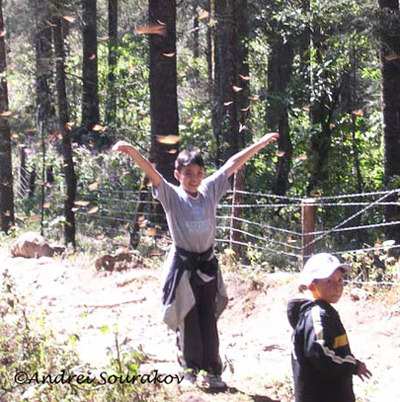 Quantitative changes in forest quality in a principal overwintering area of the monarch butterfly in Mexico, 1971-1999. Conservation Biology 16: 346-359. Brower LP et al. 2004. 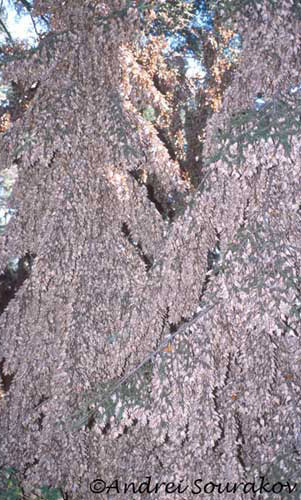 Catastrophic winter storm mortality of Monarch butterflies in Mexico during January 2002. 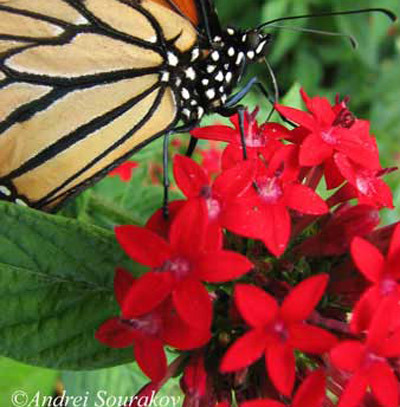 In The Monarch Butterfly: biology & conservation. By Oberhauser KS, Solensky MJ. Cornell University Press. 248 pages. Dockx C. 2007. Directional and stabilizing selection on wing size and shape in migrant and resident monarch butterflies, Danaus plexippus (L.), in Cuba. Biological Journal of the Linnean Society 92: 605-616. Frey D. 1997. 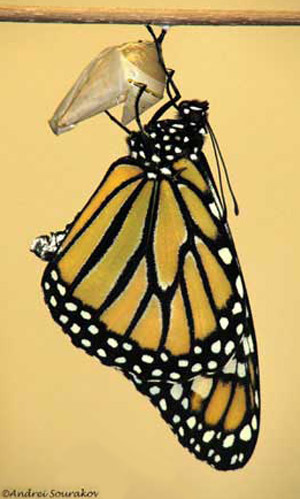 Resistance to mating by female monarch butterflies. North American Conference on the Monach Butterfly, Jürgen Hoth (editor). 428 pp. Froy O, Gotter AL, Casselman AL, Reppert SM. 2003. Illuminating the circadian clock in the monarch butterfly migration. Science 300: 1303-1305. Hansen JLC, Obrycki JJ. 2000. Field deposition of Bt transgenic corn pollen: lethal effects on the monarch butterfly. Oecologia 125: 241-248. Malcolm SB, Brower LP. 1989. Evolutionary and ecological implications of cardenolide sequestration in the monarch butterfly. Cellular and Molecular Life Sciences 45: 284-295. McLaughlin RE, Myers J. 2007. Ophryocystis elektroscirrha sp. n., a Neogregarine pathogen of the monarch butterfly Danaus plexippus (L.) and the Florida queen butterfly D. gilippus berenice Cramer. Journal of Eukaryotic Microbiology 17: 300-305. Oyeyele SO, Zalucki MP. 2008. 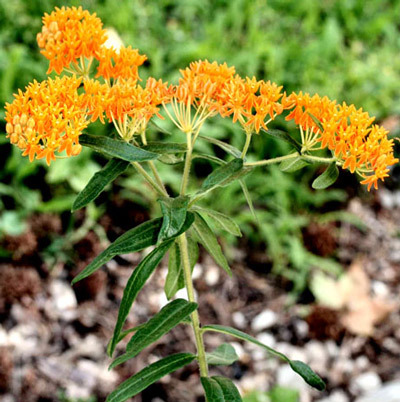 Cardiac glycosides and oviposition by Danaus plexippus on Asclepias fruticosa in south-east Queensland (Australia), with notes on the effect of plant nitrogen content. Ecological Entomology 15: 177-185. Pyle RM. 1984. International efforts for monarch conservation, and conclusion. Atala 9: 21-22. Reppert SM. (2007) The ancestral circadian clock of monarch butterflies: Role in time-compensated sun compass orientation. Cold Spring Harbor Symposia on Quantitative Biology 72: 113-118. Ritland DB, Brower LP. 1991. 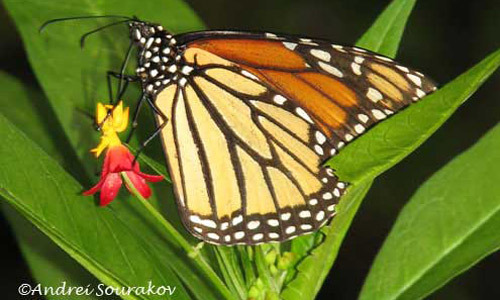 The viceroy butterfly is not a batesian mimic. Nature 350: 497-498. Sauman I, Briscoe AD, Zhu H, Shi D, Froy O, Stalleichen J, Yuan Q, Casselman A, Reppert SM. 2005. Connecting the navigational clock to sun compass input in monarch butterfly brain. Neuron 46: 457-467. ScienceDaily. (March 2009). Genetic basis for migration in monarch butterflies uncovered. http://www.sciencedaily.com/releases/2009/03/090330200615.htm (20 April 2009). Shapley D. (2008) Monarch Butterflies are out of the woods. thedailygreen. http://www.thedailygreen.com/environmental-news/latest/monarch-butterfly-habitat-74030711 (11 September 2008). Zhan S,	Zhang W, Niitepõld K, Hsu J,	Haeger JF,	Zalucki MP, Altizer S, de Roode JC,	Reppert SM, Kronforst MR. 2014. The genetics of monarch butterfly migration and warning colouration. Nature 514: 317-321. Zhu H, Sauman I, Yuan Q, Casselman A, Emery-Le M, Emery P, Reppert SM. 2008. Cryptochromes define a novel circadian clock mechanism in monarch butterflies that may underlie sun compass navigation. PLoS Biol 6, e4. Zhu H, Casselman A, Reppert SM. 2008. Chasing migration genes: A brain expressed sequence tag resource for summer and migratory monarch butterflies (Danaus plexippus). PLoS One 3, e1293. Publication Date: April 2009. Latest revision: December 2014. Reviewed: October 2017.